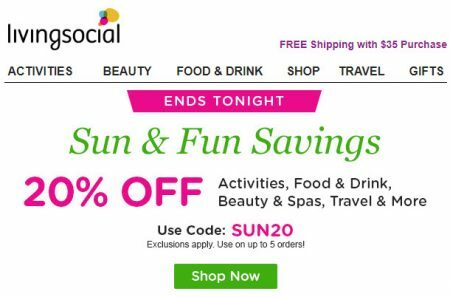 LivingSocial.com is having a Sun & Fun Savings Sale. Save an extra 20% off Food & Drink, Activities, Travel, Beauty & Spas and More when you enter the promo code SUN20 at checkout. I’ve tested the code and can verify that it works. The promo code is available for 2-days only from Monday, August 6 to Tuesday, August 7, 2018. It’s good for purchases of any amount with a maximum savings of $50. Exclusions apply.